Within the broad field of environmental geochemistry, current interests encompass paleoenvironmental and paleoclimatic records archived mainly in lake sediments, peat and coal, as indicated by isotopic (carbon, oxygen, sulphur and strontium) inorganic and organic geochemistry, and their relation to global carbon cycling. Study areas include the Hula Valley (Israel), Powder River Basin (USA), Sichuan and Yunnan (P.R. China). A related topic is the distribution of minerals and trace elements that are hazardous to health, mainly in carbon-rich sediments and fossil fuels, and their geological and enviromnmental controls. Sanchez Almazo I, Spiro B. Braga J.C. and Martin J.M. 2002 Constraints of stable isotope signatures on the depositional palaeoenvironments of upper Miocene reef and temperate carbonates in the Sorbas basin, SE Spain. Palaeogeography,Palaeoclimatology and Palaeoecology special volume "Palaeoceanography of reefs and carbonate platforms. Miocene to Recent” 175 153-172. Yates T.J.S, Spiro B. and Vita-Finzi C.2002: Isotope variability and suitability of terrestrial molluscan shell samples for 14C dating. Quaternary International Review 87 87-100. Nunez R., Spiro B. Pentecost A. Kim A. Colleta P. 2002: Organo-geochemical and stable isotope indicators of environmental change in a marl lake, Malham Tarn, North Yorkshire, UK Journal of Plaleolimnology 28 403-417. Mannino M., Spiro B.F. and Thomas K.D. 2003: Sampling shells for seasonality: oxygen isotope analysis on shell carbonates of the inter-tidal gastropod Monodonta lineata (da Costa) from populations across its northern range and from a Mesolithic site in southern Britain. Journal of Archaeological Science 30 667-679. Purvis O.W. Bamber R. Din V. Jeffries T. Jones G. Ludwhoff S. and Spiro B. 2003: Which factors are responsible for changing lichen communities in W. London Science of the total environment 310 179-189. Belogub E.V, Novoselov C. A., Spiro B. and Yakovleva B.A. 2003: Mineralogical and sulphur isotopic features of the supegene profile of Zapadno-Ozernoye masasive sulphide and gold bearing gossan deposit, South Urals. Min. Mag. 67 (2) 339-354. Large D.J., Jones T.F, Somerfield C. Gorringe M.C. Spiro B. Macquaker J.H.S., and Atkin B.P. 2003: A high-resolution terrestrial record of orbital climate forcing in coal. Geology 31 303-306. Udachin V., Williamson B.J., Purvis O.W., Spiro B., Dubbin W. Brooks S., Coste B., Herrington R.J. and Mikhailova I. 2003 Assessment of enevironmental impacts of active smelter operations and abandoned mines in Karabash, Ural Mountains of Russia. Journal of Sustainable Development 11 133-142. Trueman C., Chenery C., Eberth D.A. and Spiro B. 2004 Diagenetic effects on the isotope composition of bones of dinosaurs and other vertebrates recovered from terrestrial and marine sediments. Jour. Geol. Soc. (London) 160 895-901. Purvis O.W. Chimonides P.J. Jones G.C. Mikhailova I.N. Spiro B. Weiss D. and Williamson B.J. 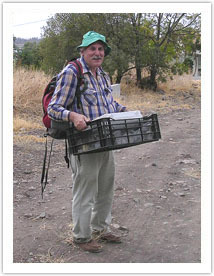 2004: Lichen biomonitoring in one of the most polluted areas in the world. Proc. R. Soc. Lond. B 271 221-226. Williamson B.J. Udachin V. Purvis O.W. Spiro B. Cressy G and Jones G.C. 2004: Characterisation of airborne particulates pollution in the Cu smelter and former mining town of Karabash, South Ural Mountains of Russia. Environ. Monit. Assess. 98 235-259. Weiss D., Kober B., Dolgopova A., Gallagher K., Spiro B., Le Roux G., Mason T.F.D., Kylander M. and Coles B.J. 2004: Accurate and precise Pb isotope ratio measurements in environmental samples by MC-ICP- MS. Int. J. Mass Spectrom. 232 205-215. Lein A.Y., Maslenikov V.V., Maslenikova S.P., Ul’yanova N.V. Zaikov V.V. and Spiro B. 2004: Sulfur and carbon isotopes in black smoker hydrothermal vent ecosystems of the Ural Paleoocean. Geochemistry International 42 668-681. Large D.J. Jones T.F. Briggs J. Macquaker J.H.S. and Spiro B. 2004: Orbital tuning andcorrelation of 1.7m.y. of continuous carbon storage in an early Miocene peatland. Geology 32 873-876. Spiro B., Weiss D.J., Purvis O.W., Mikhailova I., Williamson B.J. Coles B.J. and Udachin V. 2004: Lead isotopes in lichen transplants around a Cu smelter in Russia determined by MC-ICP-MS reveal transient records of multiple sources. Environmental Science and Technology 38 6522 6528. Astrom M. and Spiro B. 2005: Sources of acidity and metals in a stream draining acid sulphate soil, till and peat western Finland revealed by a hydrochemical and sulphur isotope study. Agricultural and food science 14 34-43. Kylander M., Weiss D.J., Martinez Cortizas A., Spiro B., Gracia Sanchez R. and Coles B. 2005: Atmospheric lead isotope evolution curve in Europe using an 8,000 year old peat core from NW Spain. Earth Planet. Sci. Lett. 240 467-485. Mason T.F.D., Weiss D.J., Chapman J.B., Wilkinson J.J., Tessalina S.G., Spiro B., Horstwood M.S.A., Spratt J. and Coles B.J. 2005: Zn and Cu isotopic variability in the Alexandrinka volcanic-hosted massive sulphide (VHMS) ore deposit, Urals, Russia. Chem. Geol. 221, 170-187. Vita-Finzi C and Spiro B 2006: Isotopic indicators of deformation in the Red Sea. Journal of Structural Geology 28 1114-1122. Sanchez-Almazo I.M., Braga J.C., Dinares-Turell J., Martin J.M., and Spiro B. 2007: Palaeoceanographic controls on reef deposition: The Messinian Cariatiz reef (Sorbas basin, Almeria, SE Spain). Sedimentology 54 637-660. Briggs J., Large D.J., Snape C., Drage T., Whittles D., Cooper M., Macquaker J.H.S and Spiro B. 2007: Influence of climate and hydrology on carbon in an early Miocene peatland. Earth Planetary Science Letters 253 445-454. LeBas M.J., Xueming Y., Taylor R.N., Spiro B., Milton J.A. and Peishan Z.,2007: New evidence from a calcite-dolomite carbonatite dyke for the magmatic origin of the massive Bayan Obo ore-bearing dolomite marble, Inner Mongolia, China. Mineralogy and Petrology 91 223-248. Tornos F., Solomon M., Conde C. and Spiro B.F. 2008: Formation of the Tharsis massive sulphide deposit, Iberian pyrite belt: geological, lithogeochemical and stable isotope evidence for deposition in a brine pool. Economic Geology 103 185- 214. Noble S.R., Horstwood M.S.A., Davy P., Pashley V., Spiro B. and Smith S. 2008: Evolving Pb isotope signatures of London Airborne particulate matter (PM10)- constraints from on-filter and solution-mode MC-ICP-MS. Journal of Environmental Monitoring 10 830-836. Belogub E.V., Novoselov K.A., Yakovleva V.A. and Spiro B. 2008: Supergene sulphides and related minerals in supergene profiles of VHMS deposits from the South Urals. Ore Geology Reviews 33 239-254. Williamson B.J., Purvis O.W., Mikhailova I.N. and Spiro B. 2008: The lichen transplant methodology in the source apportionment of metal deposition around a copper smelter in the former mining town of Karabash, Russia Environmental Monitoring and Assessment 141 227-236. Tornos F., Galindo C., Crespo J.L. and Spiro B. 2008: Greochemistry and origin of calcic tungsten-bearing skarns, Los Santos, Central Iberian Zone, Spain. Canadian Mineralogist 46 87-109. Eckardt F.D., Bryant R.G., McCulloch G., Spiro B. and Wood W. 2008: The hydrochemistry of a semi-arid pan basin case study: Sua Pan Makgadigkgadi, Botswana Applied Geochemistry 23 1563-1580.